In the midst of increasing compliance demands for emissions monitoring and nitrogen oxide (NOx) measurement in industrial applications, companies now have the opportunity to move beyond costly consumables and complex gas sample treatment associated with aging, legacy measurement systems. 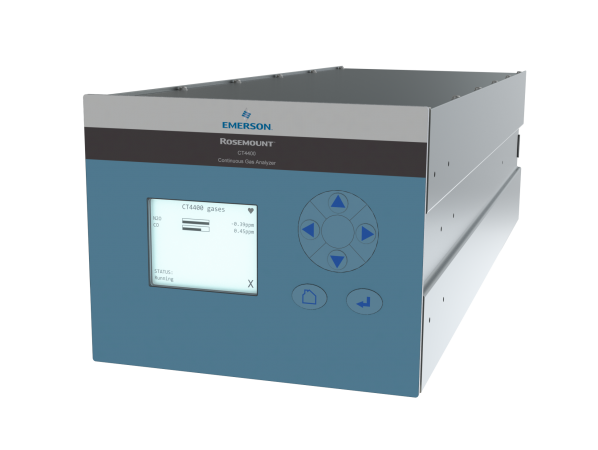 Emerson’s new Rosemount CT4400 Continuous Gas Analyzer is the world’s first purpose-built Quantum Cascade Laser (QCL) and Tunable Diode Laser (TDL) analyzer designed to help plants reduce ownership costs and report emissions accurately in environmental monitoring applications measuring standard components, such as nitric oxide (NO), nitrogen dioxide (NO2), sulfur dioxide (SO2), carbon monoxide (CO), carbon dioxide (CO2), and oxygen (O2). Optimized for cold and dry applications running at ambient pressure, the Rosemount CT4400 analyzer offers the benefits of QCL/TDL technology, including high sensitivity, accuracy, improved stability, and low-drift performance in a configuration that allows fast, easy integration into existing plant infrastructure. Because the system can hold up to four laser modules, it can measure up to seven application-specific gas components simultaneously, providing great flexibility in continuous emissions monitoring systems (CEMS) applications. This simultaneous, multi-component analysis within a single analyzer reduces the need for multiple analyzers, and thus the cost. At the heart of the Rosemount CT4400 is Emerson’s QCL technology, which detects gas molecules in both the near- and mid-infrared wavelength range. The system employs a patented laser chirp technique that enables detection of individual gas species, free from the cross-interference effects of other gas components in the stream, making the measurement highly accurate and stable down to sub ppm concentrations. This high performance ensures operators meet increasingly demanding regulatory requirements, while real-time reporting provides critical insight into process performance. Due to its purpose-built design, which produces enhanced performance at a lower cost, the Rosemount CT4400 Continuous Gas Analyzer ensures reliable detection and monitoring of gases and allows operators to avoid costly regulatory fines or unexpected shutdowns.